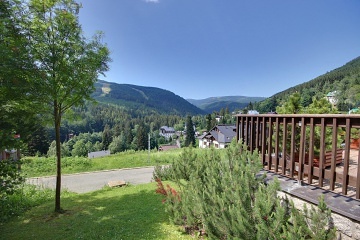 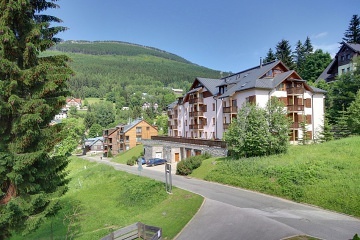 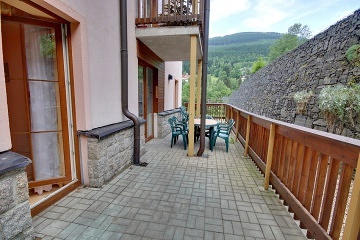 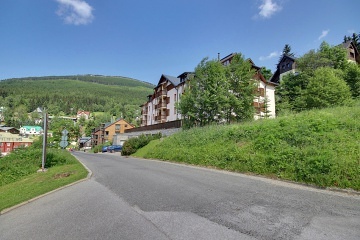 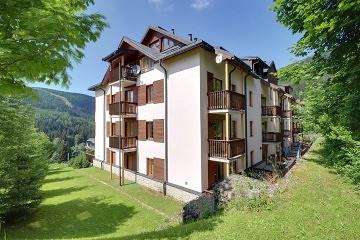 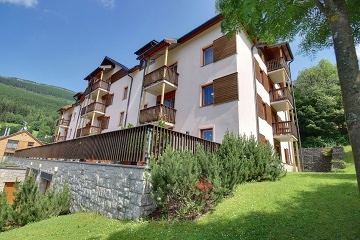 Apartments for rent Dalibor - accommodation Spindleruv Mlyn ***. 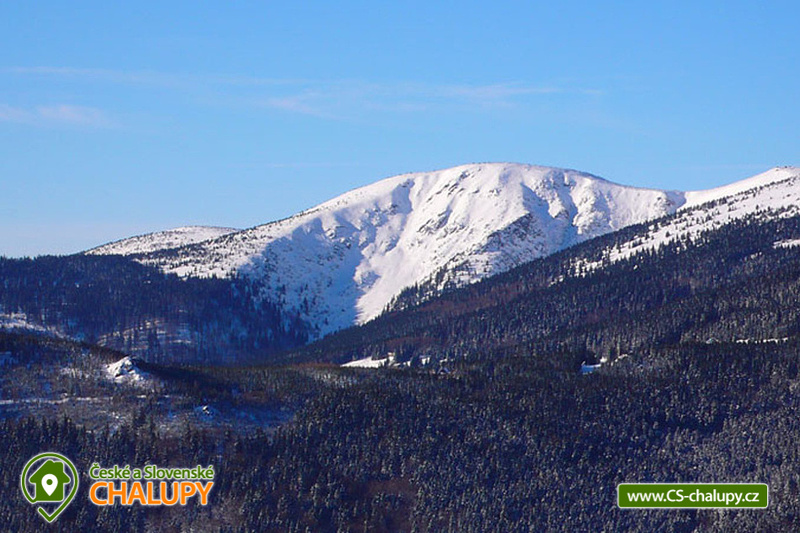 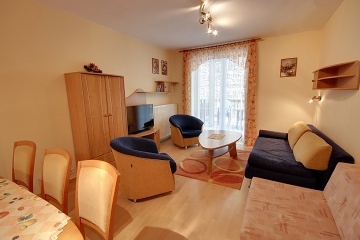 We offer accommodation in the center of Spindleruv Mlyn in 2 completely separate apartments for 6 and 9 persons. 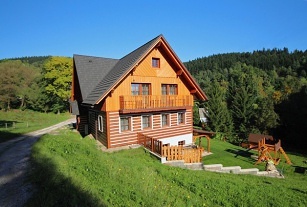 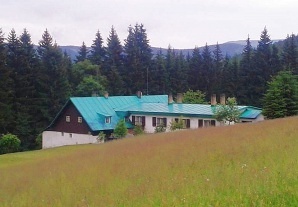 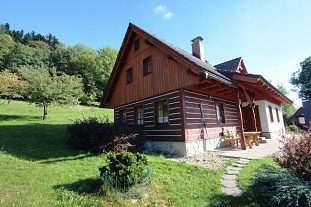 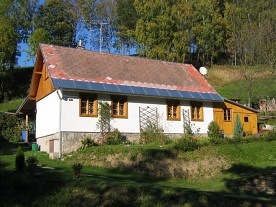 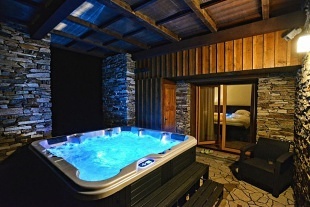 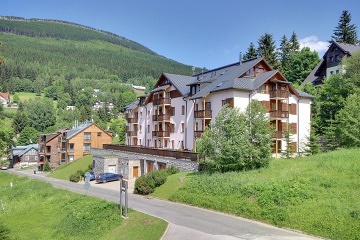 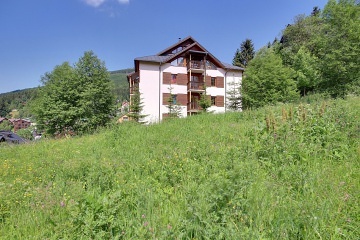 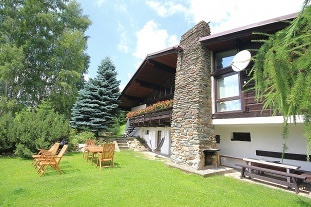 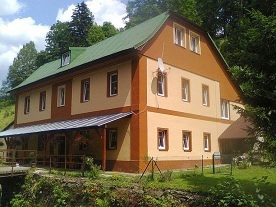 Accommodation in a newly built apartment house DALIBOR at an altitude of 760 m., Near the ski slopes and ski lifts of Špindlerův Mlýn Ski Resort. 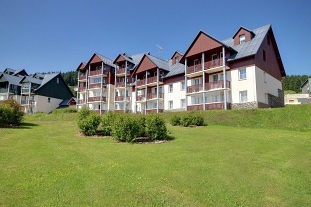 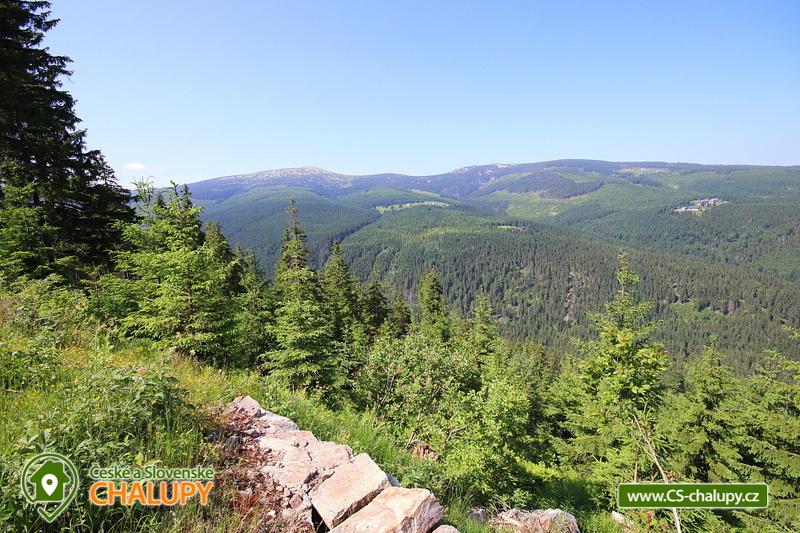 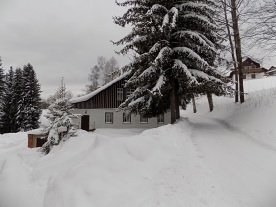 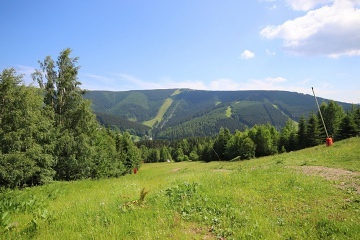 Thanks to their location, Apartments DALIBOR are the ideal place for active recreation in the beautiful surroundings of the Krkonoše National Park and the starting point for a number of hiking and biking trails. 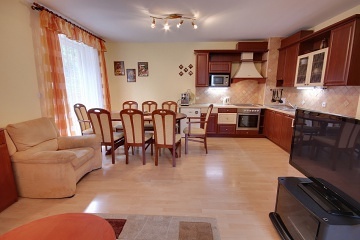 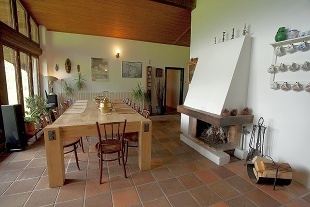 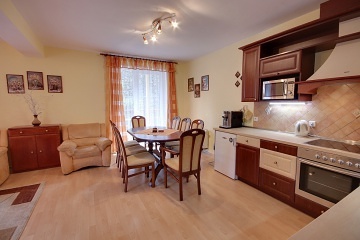 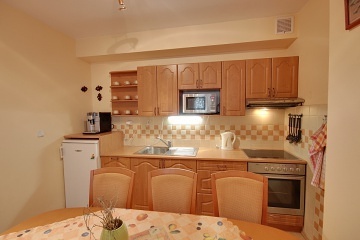 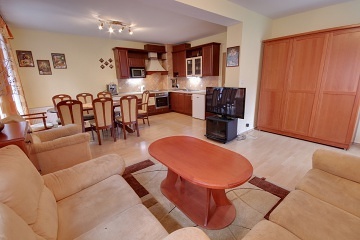 Apartment Dalibor 106 is ideal for 4-6 persons (approx. 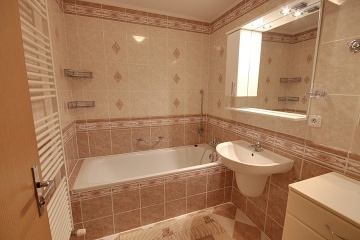 48 m2) and includes: entrance hall with built-in wardrobe, bathroom with sink and bathtub, separate toilet, bedroom, living room with kitchen and dining area, terrace. 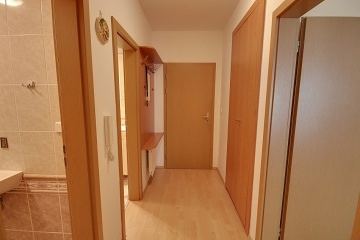 The bedroom is for 3 people (double bed + one single bed). 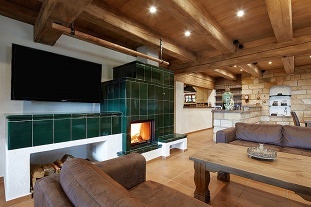 Living room with two pull-out beds and an extra bed for the 6th person. 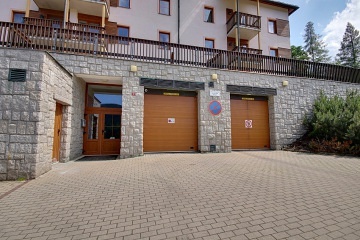 A parking space for one vehicle is available free of charge. 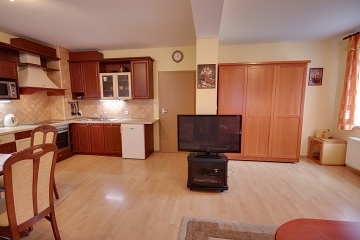 Available TV / SAT, HiFi tower (CD, MC, radio), DVD player, clothes dryer, hair dryer, iron. 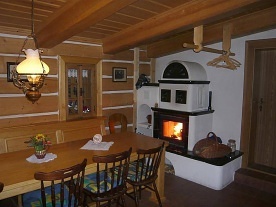 Free WiFi internet access. 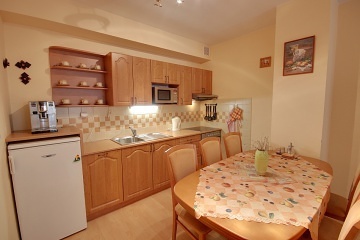 Fully equipped kitchen and dining area - glass-ceramic hob including hot air oven, fridge, microwave, kettle, toaster, coffee maker, dishes, cutlery, cleaning products, dishcloths etc. 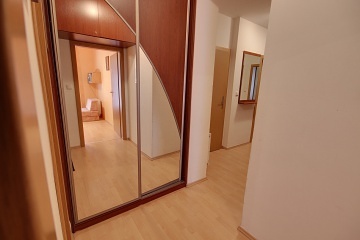 Apartment Dalibor No. 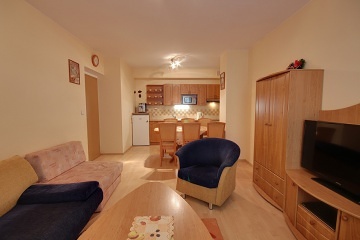 101 is ideal for 7-9 people approx. 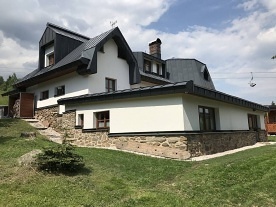 78 m2) and includes: spacious hall with built-in wardrobe and wardrobe, separate cloakroom, bathroom with sink and bath, separate toilet with small sink, two bedrooms, spacious living room connected with dining and kitchen corner, terrace. 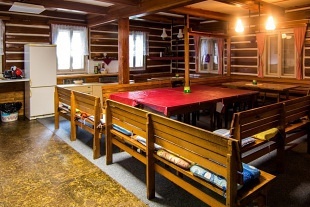 1st bedroom with three beds, 2nd bedroom with three to four beds. 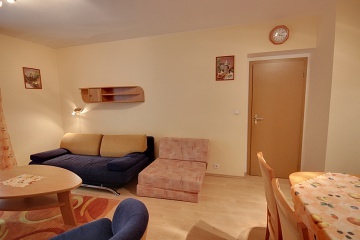 The living room has a pull-out double bed + folding seat for two more people. 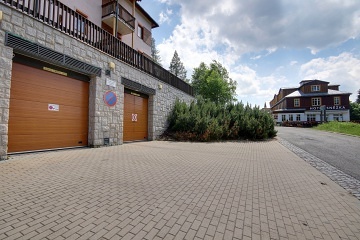 A garage parking space for two vehicles is available free of charge. 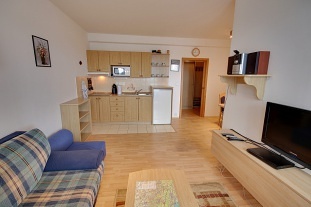 Equipment: TV / SAT, HiFi tower (CD, MC, radio), DVD player, clothes horse, hair dryer, iron. 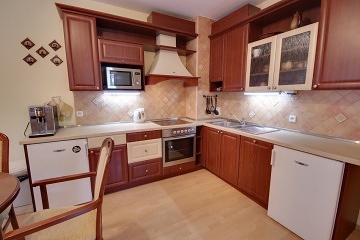 Fully equipped kitchen and dining area - glass ceramic hob including hot air oven, fridge, microwave, kettle, toaster, coffee maker, dishes, cutlery, cleaning products, dishcloths, etc. 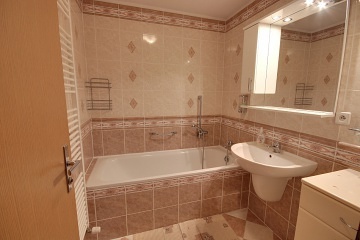 In both apartments there are all toiletries and sanitary appliances (towels, liquid soap, toilet paper, etc.). 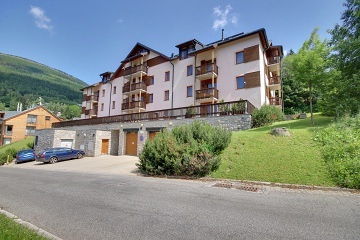 Each apartment has a ski and bicycle storage room and a garage on the ground floor of the building. 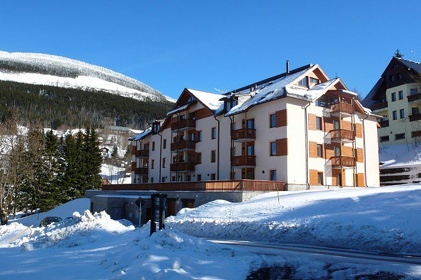 Especially in the winter, Dalibor Apartments will appreciate the excellent accessibility of both ski areas (St. Peter and Medvedin). 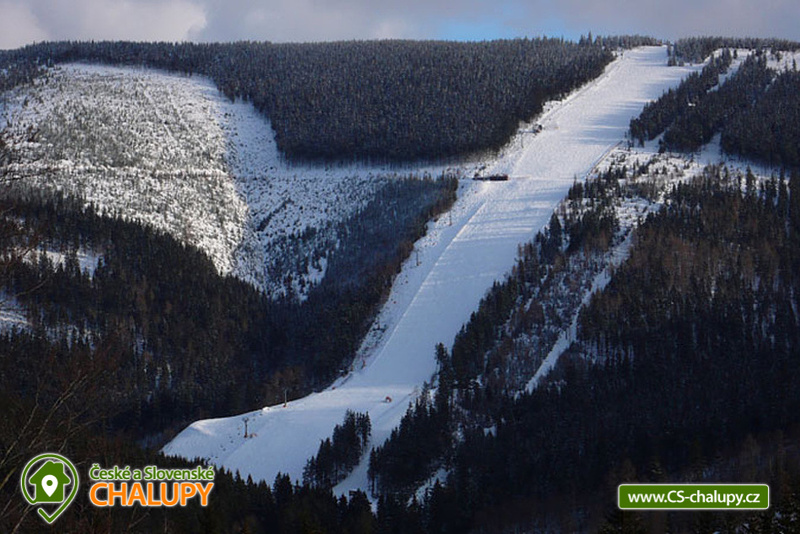 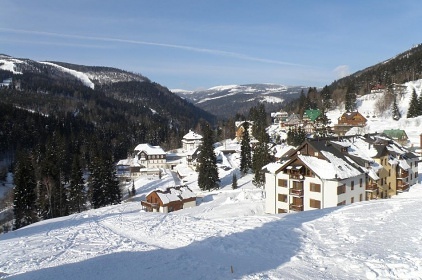 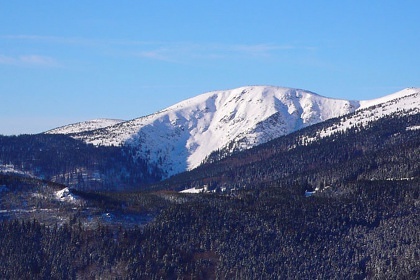 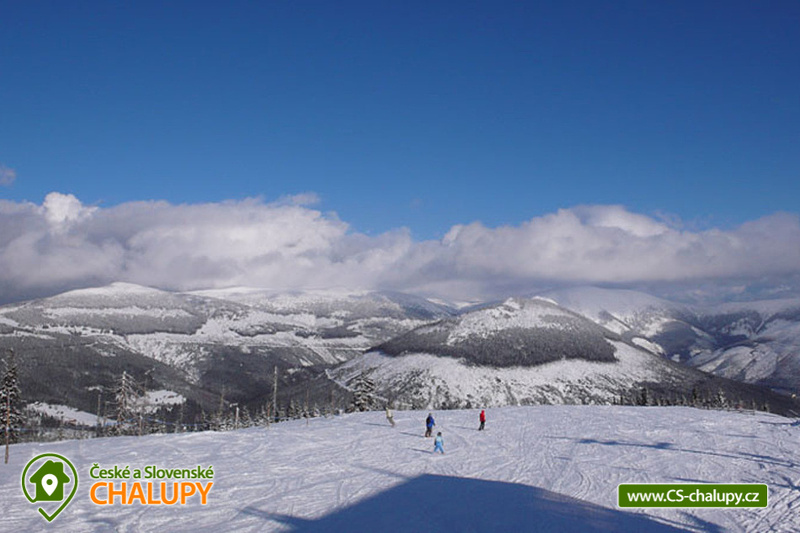 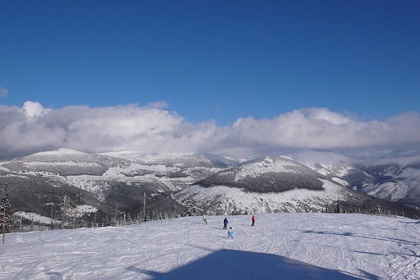 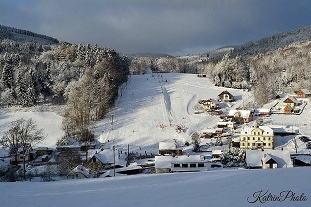 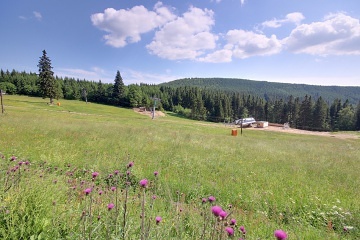 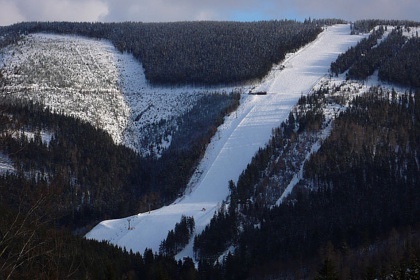 The Medvědín Ski Area is about 300 m from the apartment house (it is possible to ski), to the Sv. 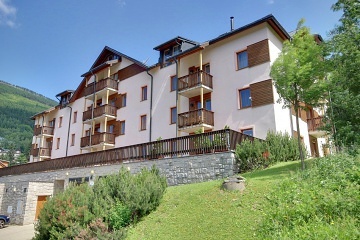 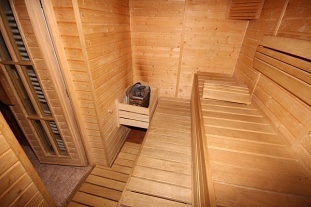 Petr can also take guests directly from the skiing apartments (approx. 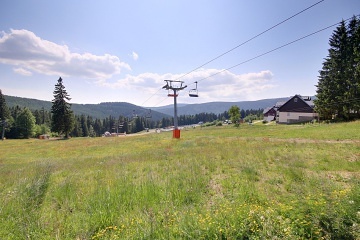 600m), while on the return journey it is advantageous to use the city-lift - Krakonoš. 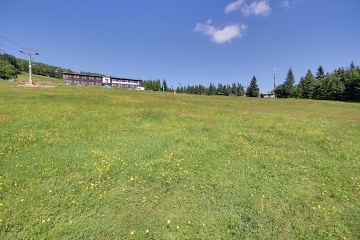 Both are connected by Skibus. 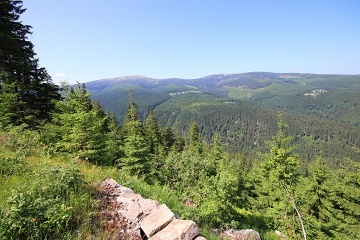 The hiking trails lead to Výrovka (4.5km) to Luční bouda (6km) to Sněžka (10km). 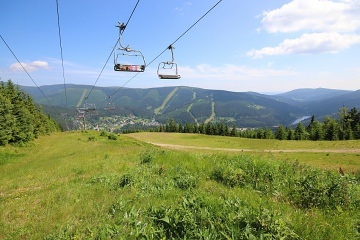 The two St. Peter and Medvedin cable car will take you to the ridges (free wagons). 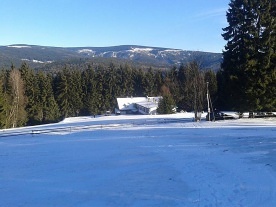 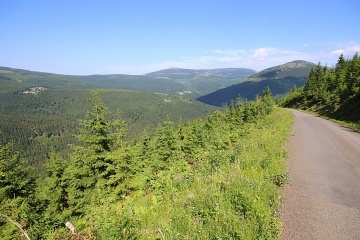 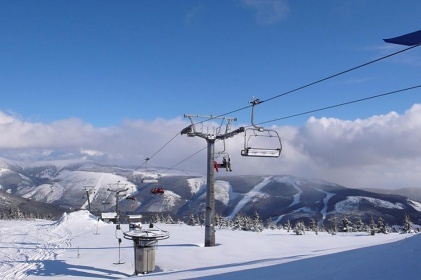 A bus or taxi will take you to the ridges up to Spindleruv Mountaineering. 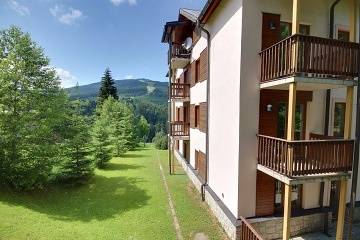 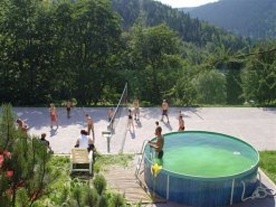 In Špindl there is the Aquapark under Medvedin, a nice indoor swimming pool is in Bedrichov in the Military Recreation Center and swimming pools for the public are also in a number of other hotels (Horal nad chalupou, Harmony ...). 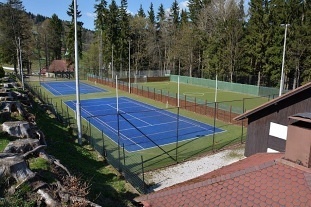 In St. Peter there are clay tennis courts, at the Harmony bobsleigh track, the Yelowpoint adrenaline center at the dam and at Medvedin. 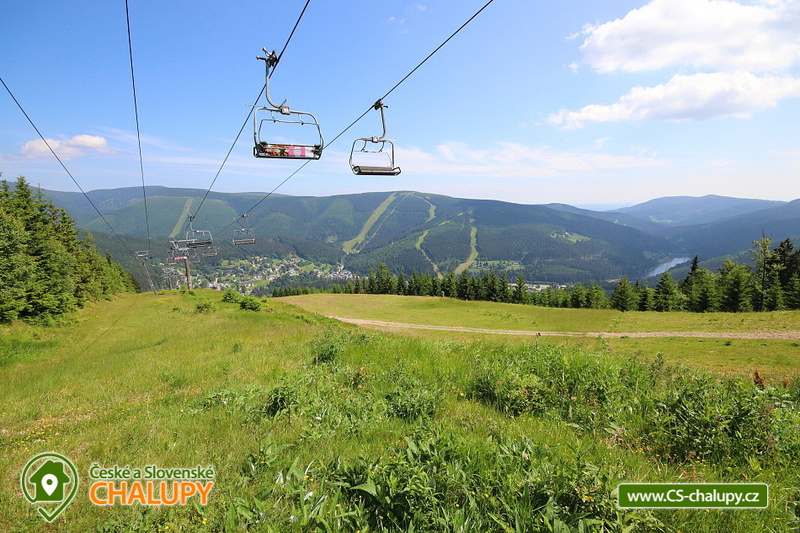 There are shops, restaurants (in summer with gardens), pastry shops, cafes, discos, swimming pools, saunas, water parks, ski rentals, bikes and other sporting goods all in the Spindleruv Mlyn all year round 7 days a week , cable cars. 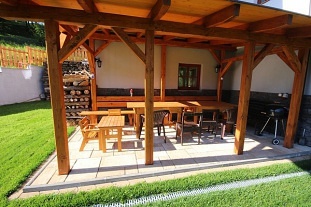 Additional information Zdarma dětská postýlka včetně povlečení. 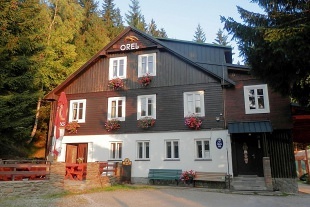 NOVĚ LZE OBJEDNAT SNÍDANĚ, OBĚDY A VEČEŘE HNED VE VEDLEJŠÍ RESTAURACI - V HOTELU SNĚŽKA. 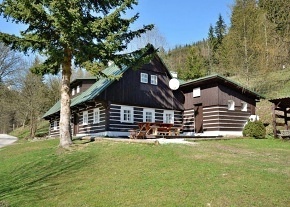 VŠE FORMOU RAUTOVÝCH STOLŮ.